Since I have been having so much fun making crochet jewelry from wire (you can see all the jewelry here), I thought it would be fun to see how it would work as a loom flower. I think I am going to attach a pin backing to it to use a broach. 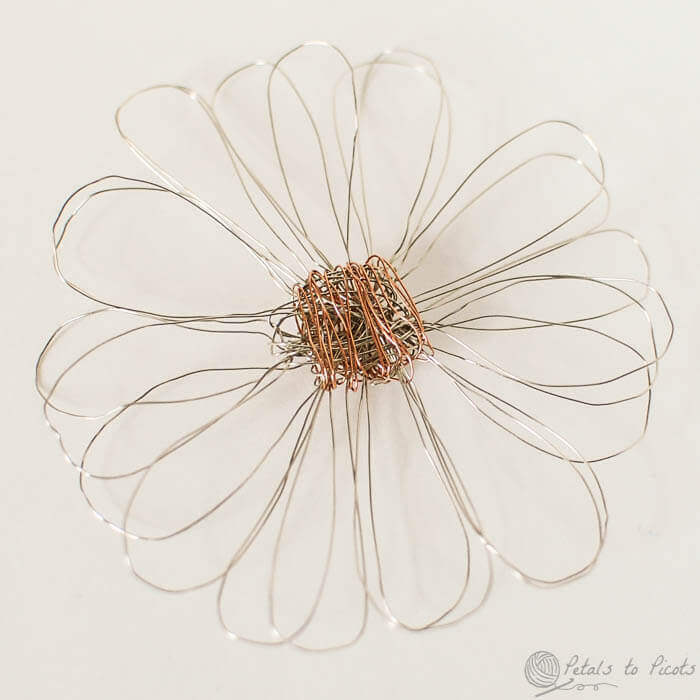 To make the wire flower, you just use the loom as you would to make yarn flowers but you use your wire instead. If you need help knowing how to make loom flowers, you can see my How to Make Loom Flowers Tutorial here. So Want To Make! I just have to go out and buy some wire! I also saw your little hershey’s kiss and I am so making that after I finish the scarf I am making!!! They are so fun to play with, aren’t they! Pretty! I saw some coloured wire at Michaels the other day that would be lovely in this design 🙂 Thanks Kara!